An MP3 player is to a professional wedding dj as a disposable camera is to a professional photographer as fast food is to have the reception catered. Consider this. If the meal is late or not what it should be, the DJ will get your guests minds off of it. If the photographer needs an extraordinary shot, the DJ will set it up. If there are any special announcements, the DJ will make them. If it’s time to toss the bouquet or cut the cake or dance with the parents, the DJ will make sure the timing is right for the most impact. If Uncle Bert wants to hear a particular song, the DJ will play it. As industry professionals, DJ’s should be paid as much as photographers or as much as caterers, but they rarely are. Brides have been known to pay $7-$9 per guest for a piece of cake and another $3.00 to have it cut and served, but they think it’s horrible to pay $10-$15 a head for entertainment. It’s the entertainment both the bride and their guests will remember; not the cake. Until a photographer or a centerpiece or an appetizer can get a group of people up to dance, an experienced, professional DJ is worth every dollar paid. There are ways to cut costs at a wedding, but using an MP3 player and eliminating a key expert who is essential to the success of a reception and contributes so much too permanent memories just sets up this “once In a lifetime moment” for complete disaster. Never book on a first call into a DJ. We often get clients coming to us either for the first time or from another DJ company they had previously hired stating “I never could get the DJ or the company to call me back.” It’s frustrating To hear from a bride or groom. My advice is never to give a credit card out over the phone to someone just b/c they have a great sales pitch or sweet voice. Take your time, and you have it unless your wedding or party is tomorrow. Then choose three of the best DJ’s you like or sites you admire and believe they can do the best for you and cater to what YOU want. Then call them, spend some time on the phone getting to know the company and what they can offer you. 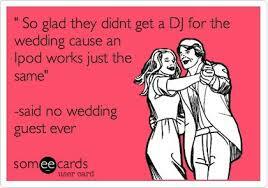 I would advise not hiring a DJ for your wedding unless he has at least ten years experience in WEDDINGS. Does the company have: Backup DJ’s? Backup Equipment? Can they play the music you want them to? Do they act as the master of Ceremonies? After talking with the three you had narrowed it down to, and then make a choice based on your conversations, their professionalism and experience, not the lowest price. Best of luck and congrats! The photo above is from an actual wedding reception that had 120 people there for dinner. Then the iPod playlist started, and now only a few remained. As you can see, there is still a lot of daylight outside, so this had to have taken before 8 pm. 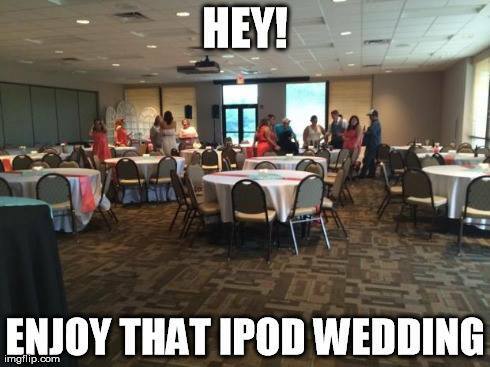 No matter what these other bloggers try to tell you, the iPod wedding just doesn’t cut it. DJ/MC/VJ Terry Tunks and his talented team of entertainers have entertained at any thousands of events over the years. Evansville, Indiana, Newburgh, Indiana, Owensboro, KY and all across Southern Indiana and Kentucky. In towns like JASPER, NEW HARMONY, FERDINAND, FRENCH LICK, WEST BADEN, HUNTINGBURG, AND SANTA CLAUS, IN. Based at one time in Louisville, KY As a result of sponsorship of Coca – Cola. SPECTRUM SOUND is just as comfortable entertaining small groups at a casual affair to 18,000 at the THUNDER OVER LOUISVILLE DERBY CELEBRATION.